Mark & Zygi Wilf just finished up with a live chat at vikings.com. On Stadium Issues – We are working hard on a stadium solution. Over the next few months we are going to be working with the Governor and Legislative leaders. In economic times such as these, this is a tremendous opportunity for Minnesotans. This project will create new jobs and ensuing revenue. In Response To Fans Who Hate Favre – I think it’s a great rivalry. That’s what makes the NFL so special – rivalries like the Vikings and Packers. With that said, our goal is to build a championship caliber team. Coach Childress, Rick Spielman and our entire football staff work hard every day to build a roster that will help accomplish that goal. 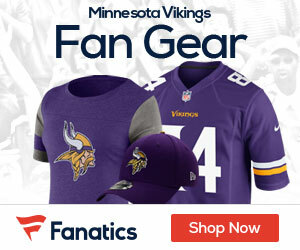 Pros & Cons of Being an NFL Owner – One of the great things about being involved in the NFL and being an owner is to experience first-hand the passion of Vikings fans and how much they appreciate the history of the franchise. It’s also special to experience how passionate they are about winning a championship. Also, we’ve also learned that it takes a great deal of effort to build the type of teamwork necessary to create a championship team. While there are challenges overall, the experinece of being NFL owners has been a dream come true. They refused to comment on the WilliamsWall legal troubles any further than saying that they hope it ends soon. On whether another veteran wide out is in the works – We’ll leave it to coach Childress and the football staff to comment on our football personnel. But we feel there’s been an improvement at the WR position since we took ownership. With the addition of Percy Harvin, plus Bernard Berrian and some of the other players, we feel like improvements are being made every day. I asked them if contract talks had started with Harvin or Loadholt yet – There is nothing new to report on those players. On Antoine Winfield’s Situation – Obviously, Antoine is a very important part of our defense. There is nothing new to report. On how it feels to be a life-long Giants fan but owner of the Vikings – At first it was a little different. But at this point our blood runs Purple and Gold! In fact, beating the Giants to win the division last year was truly a special moment and one we’ll never forget. On whether Cris Carter could potentially become more involved with this team – We have great respect for Cris. We look forward to his induction into the Pro Football Hall of Fame, hopefully very soon. We are working very hard to include alumni and special people like Cris Carter to give advice and his perspective when needed. On Harvin’s past issues – As you know, Coach Childress spent some time with Percy’s family, and as part of our evaluation of players and of Percy, we spent a great deal of time with him. Our staff feels very confident that he’s going to add a lot to our team both on and off the field. After I wished them a happy 4th anniversary since purchasing the team – We appreciate that sentiment, and as I said earlier, it’s been a great experience and we hope for a lot of Super Bowl championships in the years ahead. On the performance of Brad Childress – Our team has improved every year under Brad. He has done a good job for us and we are all on the same page. We are excited about the year ahead and having him as our head coach. Biggest hurdle this season – Our biggest challenge this season will be to first and foremost win our division. That’s how you advance in this league and that will be our goal. We are very hopeful that we can achieve our goal and from there, get to the ultimate goal of winning a Super Bowl. In the end, the Wilf’s didn’t offer up any real ground breaking information. Just the usual rhetoric. Oh well.